A paramedic has recalled the moment she leapt for her life as a truck barrelled towards her and crashed into her ambulance at a Dandenong North accident scene. Charlotte Paton spoke about the 8 May incident following a State Government move on 19 June to slow drivers to 40 kilometres an hour when passing stationary or slow-moving emergency vehicles with lights or sirens on after 1 July. 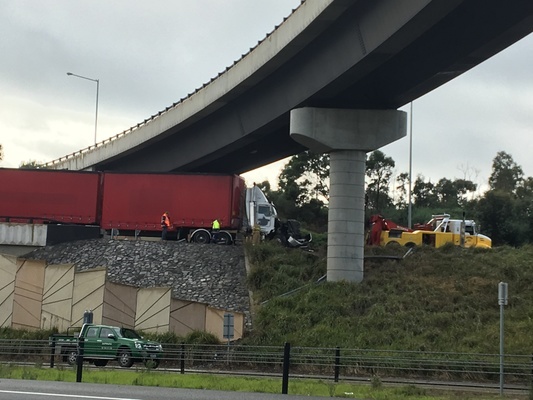 She was called to an accident involving one patient on the Monash Freeway ramp onto EastLink, Frankston-bound, about 5.40am. Ms Paton and her colleague were assessing the patient when a bystander shouted “run”. “We all looked back at this stage and saw a massive truck coming towards us,” she said. “I was kind of in disbelief when I first saw it and I just thought ‘I need to get out of the way’. “So we ran down the emergency lane and jumped the barrier. The new rules require that after passing the emergency vehicle, drivers should not increase their speed again until reaching a safe distance from the scene. The infringement fine is $277. The new rule will apply to Victoria Police, Ambulance Victoria, Metropolitan Fire Brigade, CFA and SES vehicles. It also applies to VicRoads Transport Safety Service vehicles with magenta flashing lights.